February is all about love and passion, and you couldn’t ask for a better month to celebrate dental awareness. Just ask Dr. Julia Wheeler and her caring team at Grovetown Family Dental. They are passionate about healthcare. They love helping patients with their total dental needs and showing how a healthy mouth positively affects your entire body. 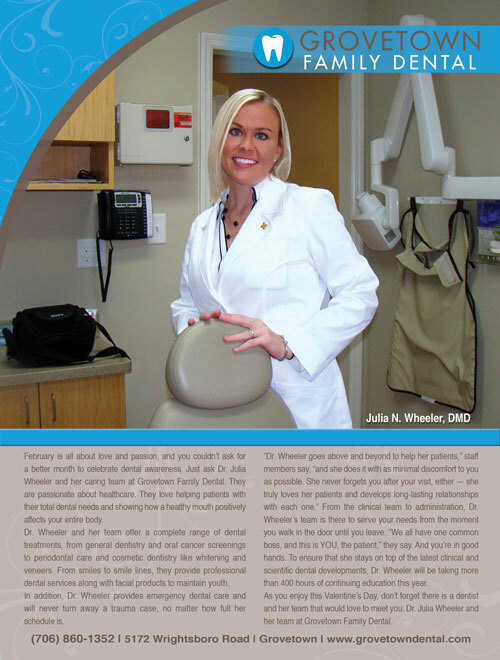 Dr. Wheeler and her team offer a complete range of dental treatments, from general dentistry and oral cancer screenings to periodontal care and cosmetic dentistry like whitening and veneers. From smiles to smile lines, they provide professional dental services along with facial products to maintain youth. In addition, Dr. Wheeler provides emergency dental care and will never turn away a trauma case, no matter how full her schedule. “Dr. Wheeler goes above and beyond to help her patients,” staff members say, “and she does it with as minimal discomfort to you as possible. She never forgets you after your visit, either — she truly loves her patients and develops long-lasting relationships with each one.” From the clinical team to administration, Dr. Wheeler’s team is there to serve your needs from the moment you walk in the door until you leave. “We all have one common boss, and this is YOU, the patient,” they say. And you’re in good hands. To ensure that she stays on top of the latest clinical and scientific dental developments, Dr. Wheeler will be taking more than 400 hours of continuing education this year. As you enjoy this Valentine’s Day, don’t forget there is a dentist and her team that would love to meet you: Dr. Julia Wheeler and her team at Grovetown Family Dental.